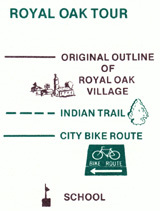 Note: Originally prepared as a three-fold paper brochure by the Royal Oak Beautification Council, Inc., ca. 1978. Attention: You are invited to print-off this tour module and use it as you like in learning about our town. You may wish to take it on a drive or walk around town and check items off as you see them. Direct questions and comments to the webmaster.